If you are going to launch a new location app, creating an anti-Foursquare is probably not a bad idea. About a week ago, a Qualcomm-incubated project called Neer quietly launched on the Android market, and has been downloaded more than 10,000 times since then. Neer is a free, location-sharing app designed for private sharing between family members and people with close, real-world relationships. 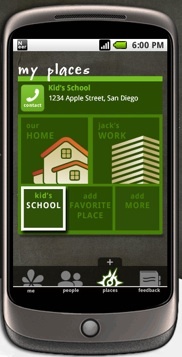 An iPhone app and Web interface are also in the works. Somewhere in between the concept of the explicit check-in and constant geo-tracking is the notion of geo-fences. The idea is that you would basically draw fences around neighborhoods or other locations from where you want to broadcast where you are and places where you don’t. With Neer, you create a geo-fence around certain places like home, work, or school simply by marking them on your phone when you are there. Entering or leaving the location triggers an update message to your inner circle. Rather than seeing where you are on a map, all they see is the name you’ve given each place. 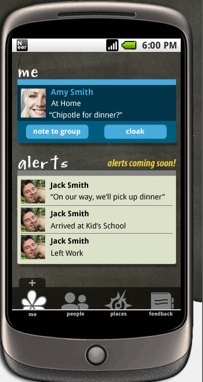 Neer is designed to be private for people who are turned off by the over-sharing of Twitter and Foursquare. You can’t broadcast your location to the public, only to your contacts. And in order to be connected on Neer, both people must have each other’s contact information in their phone address books, and both must have the app installed. It is almost as if Neer wants to make it hard for you to find people to track. And that is kind of the point. Neer is for people who constantly have to keep track of each other and already do so with phone calls, such as husbands and wives with small children. Instead of calling every night to see if a spouse has left work yet in time to help feed the kids or put them in bed, or whether the school drop-off was successful, they can get a reassuring geo-alert. You can also add a text message. Creating geo-fences that work is a hard problem that pretty much all the geo startups are working on. “As far as I am aware, we are the first geo-fenced location service,” says Neer project leader Ian Heidt. The Qualcomm engineers who built Neer figured out a way to use a combination of WiFi and GPS signals to create and monitor geo-fences without draining the battery too much. Neer is part of a new business incubation unit at Qualcomm that will be announced at the end of this month called Qualcomm Services Labs.